Laura Sharp, a phonics expert with thirty years' experience in primary education, answers the most frequently asked questions about the Year 1 phonics screening check. 1. What is the Year 1 phonics screening check? 2 .What is in the phonics screening check? 3. What sort of check is it and is it compulsory? 4. What does it check? 5. What are nonsense or pseudo words and why are they included? 6. Is there a pass mark? 7. What happens to the results? 8. Do all schools and children have to participate? 9. What can I do to help my child? 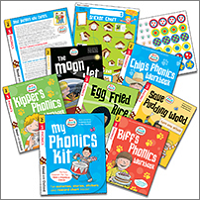 Visit the Phonics made easy page for further hints and tips to help you find out more about phonics and to hear the letter sounds, as well as how to help your child in the most effective way. See below for information about My Phonics Kit. You'll find more advice from Laura on supporting your child with phonics on the Oxford Owl blog. 10. What should I do if my child is struggling to decode a word? If you want to support your child with some fun phonics practice at home, this kit is specially developed for 6–year-olds.